When the kitchen water pipe in her aging St. Paul house unexpectedly burst, homeowner Sherrie knew she had her work cut out for her finding the right contractor to repair the damage. 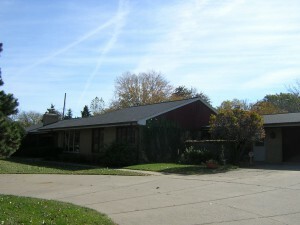 The house was built in 1953 and was beginning to show major signs of aging despite the 1000-2000 square foot addition that had been built on in 1962. On top of peeling, discolored wallpaper and a kitchen ceiling which sagged due to water build-up from a leaky roof, the water pipe in Sherrie’s kitchen had been slowly leaking for some time without her knowledge before it finally burst one day. The resulting damaged walls, uprooted ceramic tile floor, and demolished basement ceiling only added to the years of water damage the finished lower level had sustained from heavy rains and general wear and tear. Fixing the damage and renovating the home would require a great amount of creativity, determination, and flexibility from the contractor, and Sherrie was adamant about finding exactly the right person for the job. She researched, contacted, and interviewed dozens of contractors, but couldn’t seem to find one that could handle the unique and complex work involved in the project, until she met Doug. Though the project had many unique challenges it was completed in an impressive 60 days. Sherrie attributed the speedy job to the skill, work ethic, and professionalism of Doug and his team. “I cannot tell you the number of times that Doug went out of his way, above and beyond the call of duty to meet every challenge and perfect every aspect. He was never completely satisfied until I was,” she remarked.